In the At Home with Martin & Sylvia story "Fruit Cake," Momma, Sylvia, and Martin do some baking. You see, Momma has a family holiday tradition — a competition, really — in which all of the aunts and uncles and cousins in her extended family bake a fruitcake and send it to Nanni and Poppi to judge. This year Momma wants to win (she has never had that honor) — and so she enlists Martin and Sylvia to help create a new recipe. Suddenly, Sylvia begins to empty the pantry and refrigerator of everything sweet, nutty, and fruity, until the counter is covered with options. Momma looked at the many ingredients and then looked down at Sylvia, who sat contentedly on her stool. “What do you mean ‘all’?” asked Momma, looking at them all. “All the things. We should use ALL the things,” she said, holding out her hands. “All the things?” asked Momma looking a little overwhelmed. “All the things!” said Sylvia again in her bold and enthusiastic voice. And so they do! Dried fruits, nuts, jam, cocktail cherries — you name it! It all goes into a Fruitcake Cookie recipe that is sure to be the winning entry in this year’s competition. 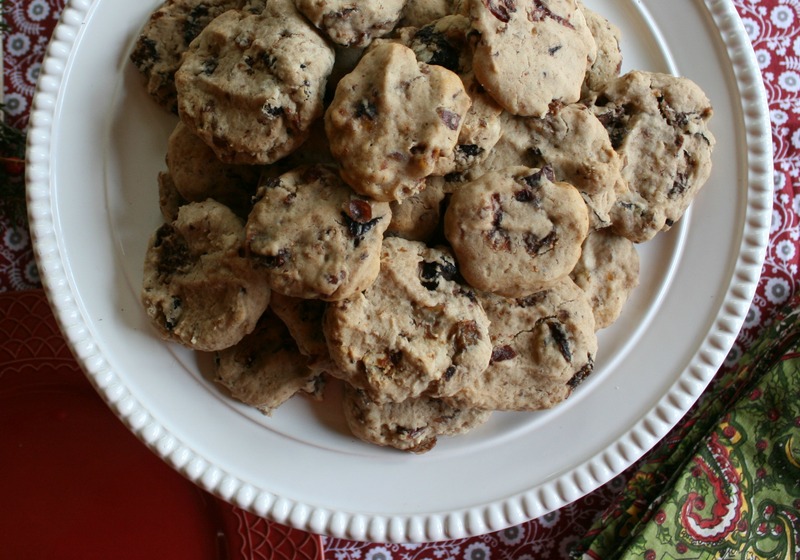 We're sharing a recipe for All-the-Things Fruitcake Cookies so you can pull things from your pantry too and whip up some unique holiday treats! In a separate bowl, cream the butter, cloves, sugar, and brown sugar with a mixer on medium speed until smooth, 2-3 minutes. Change the mixer to low speed and add the egg. Mix until well-combined. Then add the apricot marmalade and mix until combined. With the mixer still on low, slowly add the flour and ¼ teaspoon salt. Mix until just combined, being careful not to overmix. Drain the fruit and add to the batter. (A little liquid left with the fruit is fine.) Combine until gently mixed. Line baking sheets with parchment paper. With wet hands, scoop up a lump of dough (about 3 tablespoons in size) and form into a ball. With the palm of your hand, gently press the ball down onto the lined baking sheet until it forms a flattened, round cookie shape no thicker than ½ inch. Repeat with the rest of the dough, placing the cookies about ½ inch apart. Bake for 25 to 30 minutes, until lightly golden. If you feel like enlisting the little people in your kitchen, I’m sure they can find All Sorts of Things to add to the All-the-Things recipe. Let us know what worked in your version! The playhouse is a spaceship. The garden is a jungle. And the brook is a home to fairies and other magical creatures. Join Martin and Sylvia -- two delightful and all-too-familiar children -- as they explore the infinite possibilities of their sweet home in the woods. These stories follow the rhythms of family life through the four seasons, delighting in the creative endeavors and sweet adventures of the much-loved brother and sister.